Can the Mother of the Bride Wear Pants? Can the Mother of the Bride wear pants? My daughter is getting married soon, and I’m not sure if Mother of the Bride pantsuits are acceptable or even stylish? Can you help? Thanks, Beth. No need to worry. While most Mothers of the Bride or Groom do wear dresses, it’s also perfectly fine to wear pants. There are many reasons why some women prefer pants. For example, they may not feel comfortable showing their legs, or they may not want to feel cold. Others find pants comfier than dresses, and then there are some who say pants are just more their personality. Whatever the case, pants are an appropriate and stylish option for the Mother of the Bride (or Groom) in 2019. Just make sure your pants are dressy, not casual or too businesslike. Let’s look at four options. Most weddings are dressy, elegant affairs, so if you are going to be wearing pants, a dressy mother of the bride pantsuit is your best choice. Dressy MOB/MOG pantsuits have the look and feel of cocktail wear. They’re soft and flowy like an evening dress and are made of light drapey fabrics like silk, chiffon, jersey nylon and polyester. Three piece formal pant suits are most popular for the Mother of the Bride or Groom. They consist of flowy pants – wide leg or full palazzo style. Then, there’s the top or shell. It is usually sleeveless and can be flowy or more fitted. Typically the shell is made of or embellished with lace, satin, crystals, sequins or sheer bits of fabric. The third piece is the pantsuit jacket which is soft, light and flowy, in keeping with the pants. It is usually quite long, and often sheer or lace. The jacket pulls the whole look together, so you appear more polished. It’s also handy for hiding a few extra pounds. This sophisticated three piece chiffon pantsuit (above) is a great example of what to wear to your child’s wedding. The high low hem on the jacket gives this classic style a modern touch. As for color, most of Mother of the Bride pantsuits are all one color or tone-on-tone. This is for two reasons. All one color looks more formal and elegant than mixing 2 different colors, or mixing a solid with a print. Also, a monochromatic outfit is the most slimming look. A solid swipe of color from head to toe makes you look taller and thinner. For fall 2019, navy blue and also purple mother of the bride pantsuits are trending. Many women also like 2 piece formal pants suits. They’re similar to 3 piece pantsuits in that they are soft and flowy, but look more like a dressy Mother of the Bride jumpsuits. This dressy two-piece matched set is a popular style. Some have cold shoulder details; Others have a poncho top that is loose, and lovely, especially when you want to hide a bit of a tummy. If you want something a little bolder and modern, go for a one-piece jumpsuit like this pretty pink one. Note: Black is a popular color for Mother of the Bride pantsuits. A dressy black pantsuit is quite acceptable to wear, so long as you check with the bride. Some brides still see black as too dark and depressing for a wedding, when it is chic. When the wedding is very small, or earlier in the day, or if the reception takes place in a home or at a low-key venue, then a more casual or semi-dressy pantsuit is fine. This usually means a matched set consisting of a print top (and or jacket) and solid colored pants. Classy separates can also work so long as the fabrics are elegant. For a noon hour wedding, you might go for a pair of soft, cream pants a ruffled blush colored floral blouse, fine jewelry and maybe even a soft, short jacket if you like. A pair of Shantung or Silk Dupioni pants with a lace or silk top would also be nice. Make sure you honor the bride, even if the wedding is casual by making sure your outfit is coordinated, and you look special. Here are some Mother of the Bride Pantsuits and Jumpsuits in stores now. These come in all sizes including plus size mother of the bride pantsuits. You’ll dazzle and delight guests in this cold shoulder two-piece Jersey knit pantsuit. It’s a great option if you prefer to keep the focus above the waist. With details such as cold shoulders and sequin tonal trim, all eyes are sure to be focused on your upper half where this top shows off and flatters your shoulders. Plus size here. You’ll be keeping your options open with this three-piece pantsuit that features a sequin top and a sheer knee-length jacket. If your son or daughter will be getting married during the summer heat, a jacket like this one with sheer sleeves is a nice option when you want arm coverage but don’t want a heavy fabric. Plus size here. Lace if feminine and delicate and an excellent choice for the mother of the bride or groom. This long, sequined lace jacket, paired with a matching lace shell and wide-leg chiffon pants, creates an elegant silhouette. I like this tan color for a wedding that takes place in the early afternoon. It’s also available in a pretty teal color. Plus size here. This elegant pantsuit features the sparkle of sequin lace and the demure coverage of a sheer, flowing poncho. What a beautiful alternative to a jacket and a festive touch for a wedding celebration. Plus size here. Every mother of the bride or groom loves a stylish-yet-comfortable choice. This pantsuit’s sequin-accented lace trimmed neckline and matching cuffs are minimal accents that make a bold statement without compromising comfort. Similar- plus size here. Crafted of flowy georgette, this three-piece pantsuit in a gorgeous shade of wine is trimmed in satin and topped with a beaded neckline. This color is stunning and is flattering on every skin tone and hair color. Plus size here. 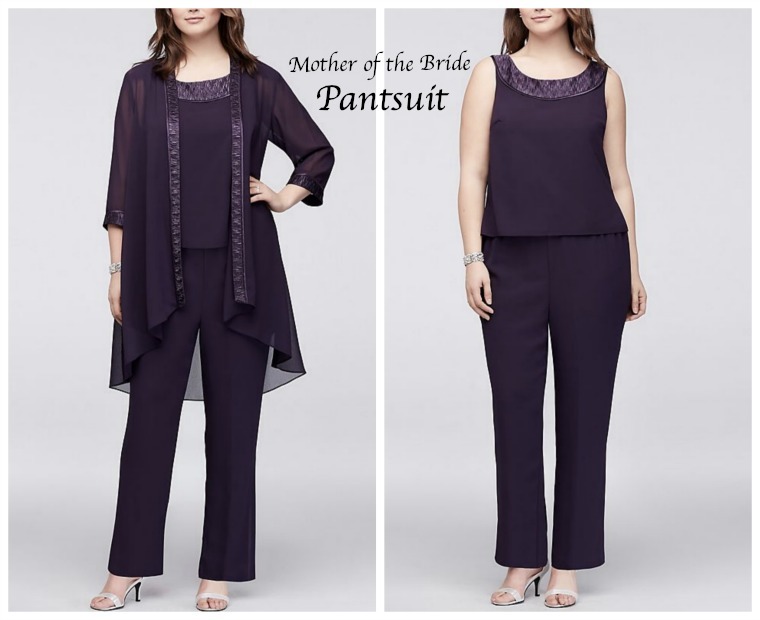 Where to Buy Plus Size Mother of the Bride Pantsuits? What do you think about wearing pants when you are the Mother of the Bride or Groom?